To quote Don (Michael) Corleone in Godfather Part III, “Just when I thought I was out… they pull me back in!”. Just when I thought that this Audemars Piguet Royal Oak Jumbo would keep me quiet for some time, my watch friend Michael (not Corleone) mailed me a few days ago, that he pulled the trigger on this fabulous blue dial Audemars Piguet Royal Oak Chronograph ref.25860. 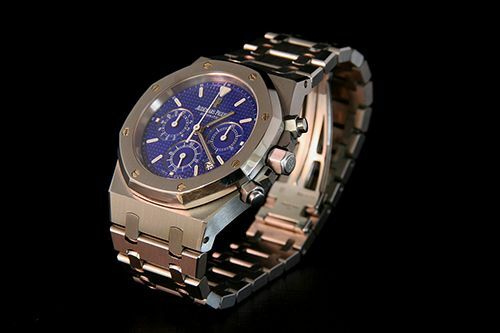 This predecessor of the current AP ref.26300 chronograph, is mighty interesting. 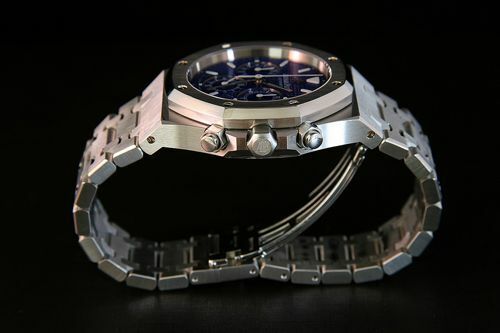 Priced a bit more friendly than its successor, it doesn’t differ that much watch wise. Although I can’t get it confirmed, the bezel of the newer 26300 is a bit wider than the 25860’s bezel. Not in terms of diameter, but the bezel itself, making the dial of the 25860 chronograph looking a bit larger then the one on it’s successor. The movement in this baby isn’t a module as with the Off-Shore models, but a true chronograph movement based on F.Piguet’s caliber 1185. Another example of a time piece using this movement is the Vacheron Constantin Overseas chronograph I recently covered here (click here for the article). Although I wouldn’t mind owning an Off-Shore Chronograph, this movement makes this watch more interesting technically speaking. There is nothing wrong with an add-on chronograph module, but the fact that the date needs a cyclops on the Off-Shore models because the chronograph module has been fitted between the base movement and the dial would annoy me too much I guess. If you haven’t tried a Royal Oak yet, please do. The bracelets are so comfortable and the polished and brushed parts of the case and bracelet are truly delightful to look at, especially when you let the (sun)light play with them. Did you notice what’s wrong with Michael’s chronograph though? 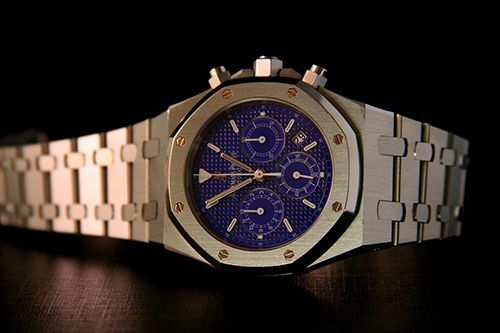 If you want to get an Audemars Piguet catalogue from 2000 (the Audemars Piguet #1 book) for free – including shipping – leave a comment with what you think is not correct on this watch. I will randomly select a winner at the end of this week.